I’ve been blown away, and immensely gratified, by the amazing response people have had to my post on Lanchester’s Laws and 40K. So I thought I’d do a brief followup based on a modification first suggested by WestRider, author of the blog Cascadian Grimdark and asked by another commenter: What if some Imperial ships can’t be turned, because they blow their drives or what have you? Basically, how often do the crews of the beleaguered Imperial vessels need to do the Space Marine equivalent of that most Guard like of commands: “On my position, fire for effect.”? Now, there’s only one example if this in Ruinstorm. The battle barge Samothrace, the Ultramarines flagship, realizes what is happening. Its captain decides on the Theoretical: “Nuts to that.” and this the Practical, which salvo of danger-close Cyclonic Torpedos which damage the Veritas Ferrum and completely consume the Samothrace, preventing it from becoming a revenant vessel. 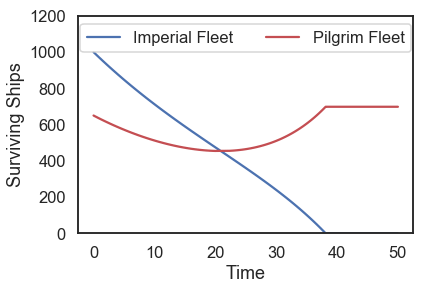 We’ve introduced s new parameter, $\gamma$, which we’ll treat as the efficiency at which a dying Imperial ship turns into a revenant. In the previous analysis, this was implicitly 100%. $\gamma$ = 0.5 would suggest 50% of ships turn, etc. 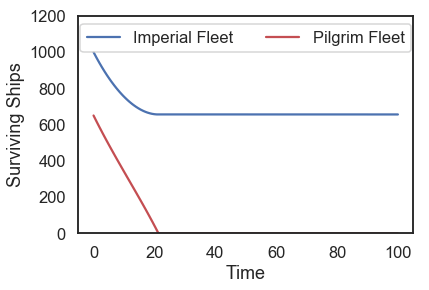 Still a victory for the Pilgrim Fleet, but a much harder fought one, with the Imperials remaining in the fight nearly twice as long, and having much diminished the Chaos force. Below that threshold, even a little bit (in this case, 0.888)? A very small increase in the efficiency of the “revenant conversion” cuts the battle time by 25% and nearly doubles the number of surviving Chaos vessels. 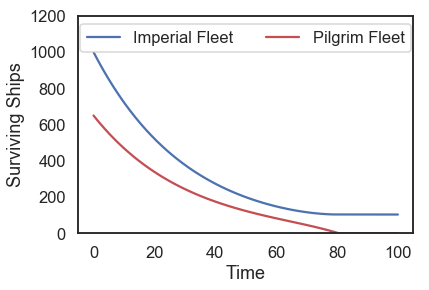 This is just another illustration showing just how big of a deal outnumbering is – a subtle push towards a more or less efficient system for converting ships ends up having a massive impact on the outcome. It definitely has to be most ships though – even conversion rates that would, narratively, seem horrific, like say 50% don’t really challenge the Imperial fleet at all. So there you have it. When facing demon fleets, make sure you self-destruct good and hard if it seems like things are going pear shaped. It was…really nice that some pretty arbitrarily chosen parameters broke the way they did.